I have succumbed to the cocktail craze! When thinking of a new hobby, I had to consider the time it will take, the cost and whether I have a true passion for it…considered and DONE! So, cocktails it is for my new hobby! I love my red wine but it’s time to diversify. Mock me for being a sheep by following the latest hot trend but I will be one happy camper when I’m sipping my homemade appletinis while I gaze out at Elliott Bay. 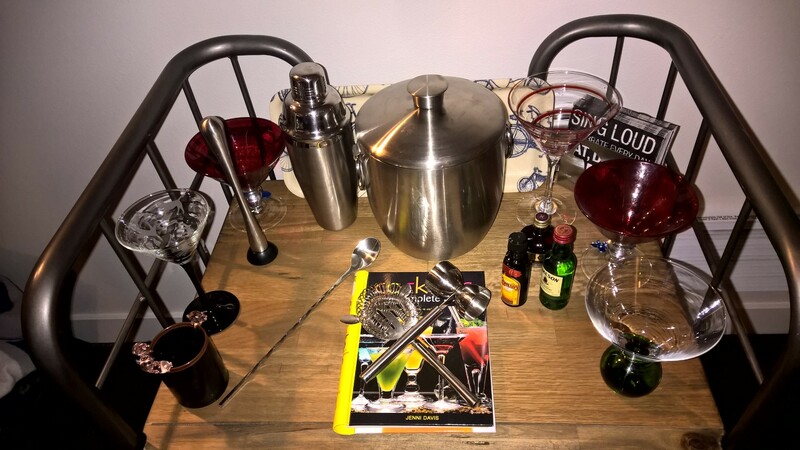 To start, though, you absolutely MUST have a cocktail cart with all the right tools to mix a masterpiece. We switched our former turntable cart and then, being the thrifty shopper that I am, I hit up the local Goodwill store where all the Amazonians donate their barware that they no longer need. I was able to find awesome unique martini glasses ($1.99), an ice bucket ($4.99), shaker ($4.99) and little Pig olive picks ($1.99) to outfit my cart. Add in the necessary cocktail book found at the used bookstore for $9.99 so I know how to mix up a great martini and I’m on my way. Next, I hit up the World Market in downtown Seattle, one of my favorite stores. There I got classic cocktail napkins, a jigger, a strainer, a muddler (mojitos!) and stirring spoon to complete my cocktail bar. They also had these teeny tiny liquor bottles I couldn’t resist–having a hard day at work? Hit up the little Kahlua or Chambord for a taste! I still have the little Irish Whiskey bottle I smuggled out of China that we got at the Irish Ball. Good times in Shanghai! But, I needed BIG bottles of liquor for my cocktails so I got to visit the local liquor store in Lower Queen Anne for the first time and find the makings for a good appletini. WOW-hard liquor costs a lot of $$$! I needed apple schnapps, melon liquor and vodka according to my cocktail book recipe-total cost $65, more than all my bar cart items combined. But, after mixing my first cocktail for my visiting friends, Patti and Larry, I realized that a little liquor goes a LONG way! I kept trying to make the appletini less potent but, in the end, just one drink knocked us on our butts. We are such lightweights! I followed my cocktail bar recipe but it sure didn’t taste as sweet as the ones we had in the bars of Shanghai. God only knows what they put into them but DAMN they were tasty! We’re off to Vancouver, Canada for a long weekend trip. Patti and I will have to get a bartender there to share his appletini secrets with us so I can come back and mix one last cocktail before Patti and Larry head home to Indiana. I think to make the winter months more interesting in dreary, wet Seattle, I might challenge myself to a try a different cocktail every weekend. Now that’s the kind of challenge I can write about!